ELL reading level/lexile information are given for each article. Users can HIGHLIGHT and LISTEN to a term in context to enable better comprehension. Comprehension tests are available at the end of many articles, with a mix of multiple choice and fill in the blank. This helps students to test their level of understanding. 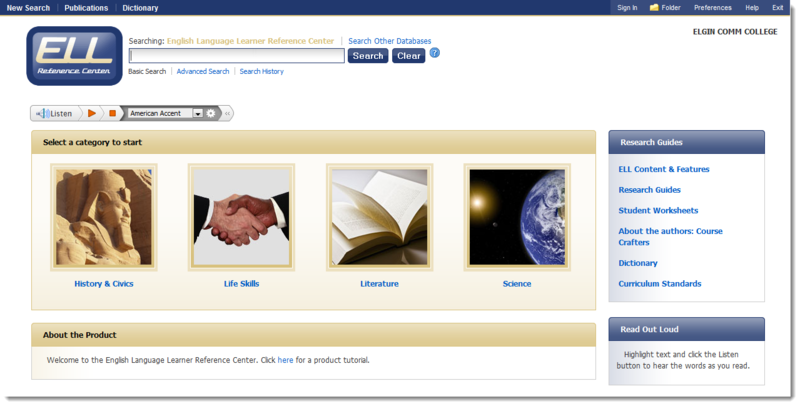 You can access the ELL Reference Center through our EBSCO interface. We have also created an ESL/ELL Research Guide, which includes an in-depth look at this database. Please see one of the librarians or email libref@elgin.edu if you have any questions.